Food trucks to finally become legal. Food trucks, like the ones found in US cities, will become legal in Korea as early as May. As part of sweeping de-regulations intended to help create jobs, the Park Geun-Hye administration will soon allow commercial trucks to be converted into moving restaurants (with wild menus). As long as food safety and cleanliness are maintained, this is a huge win for the citizens of Seoul and other big cities. Good food that’s easy on the stomach. I always ask for a little extra seaweed. 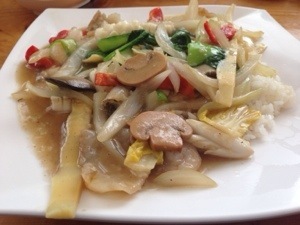 잡탕볶음밥 – Stir-fried seafood medley. 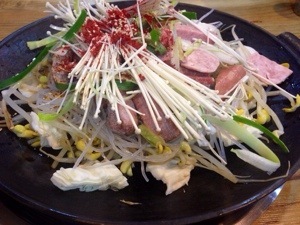 잡탕볶음밥 means ‘medley’ or ‘mishmash’ of things. A new trendy meal in Seoul is called 부대볶음. It’s basically 부대찌개, army soup, but without the soup. Bean sprouts line the bottom of the pan and only a little bit of broth is used. The broth is cooked until absorbed by the vegetables, making it a mostly soup-less meal. Buckwheat jelly, acorn jelly, potato-rice cake, and soybean soup. 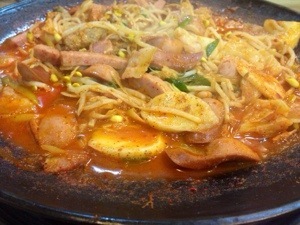 Restaurant Name: 민속콩탕 minsok-kong-tang. 민속 means ‘folk’ and 콩탕 means ‘soybean soup’. It’s a small quaint soybean restaurant located in Yongin City, Geihung district, about an hour south of Seoul. The Korean Folk Village (민속촌 minsok-chon) is located directly opposite of the shop. We ordered the 30,000Won 3-person set. 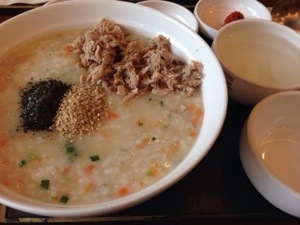 It included a larger selection of food and side dishes including chestnut pancakes, soybean porridge, stinky tofu soup. Definitely recommended if you’re out to see the Folk Village.